The typical family room is about 15 by 15 feet. While your front porch doesn't need to be that large, it's important to have enough room for circulation around the furniture you plan to use there. 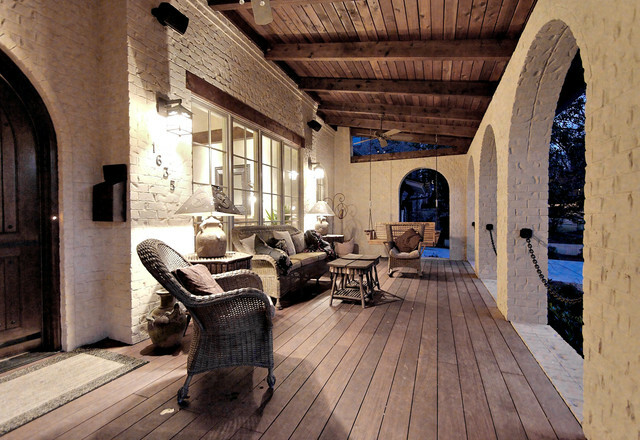 The best way to make sure you use the porch is to turn it into an outdoor room. If you have a large porch, it's easy to put out enough furniture that whole family can use. This is a great way to expand the house and create a new living room. I like to have a minimum of 8 feet of depth on the front porch. This allows for a chair and a circulation path to the sitting area. Keeping the door to one side of the sitting area will prevent a division of spaces, allowing you to fully utilize your front porch.